Wonderland is rife with stories about the consequences (initially dire or at least unhappy) of opening forbidden boxes. Sometimes the boxes come as covered baskets woven by Native Americans, sometimes they are locked rooms, sealed jars or stoppered bottles. Always the person who opens them is driven by insatiable curiosity to take a peep inside. Most often they’ve been warned to KEEP OUT! But, like the person who insists on visiting the spooky basement at midnight to investigate a strange noise instead of sneaking out the back door and running like hell while dialing 911, the insatiably curious just can’t help themselves. Tales about locked boxes are often touted as learning stories intended to make people conform. But, if we read them carefully, we find by the end justice prevails. So perhaps the stories are really about the necessity to persevere through trial, error and some suffering, in order to bring about change for the greater good. These accounts are among our oldest, old enough to be called myths, with roots that go back into antiquity. They are often complicated, richly layered tales full of twists and turn, successes and set-backs. To me, they seem like initiation stories- rites of passage. One characteristic of initiations is to take everything the student has learned and turn it upside down by teaching a seemingly opposite truth. This radical paradigm shift knocks the aspiring initiate out her/his previous assumptions into beginner’s mind; open to new ways of inquiry and conjexture. In Pandora’s Box the story seems to a warning. On the other hand ,it might offer the neophyte encouragement to continue on the journey. Or the story might be a koan meant to force the student to think more profoundly and explore alternative explanations. 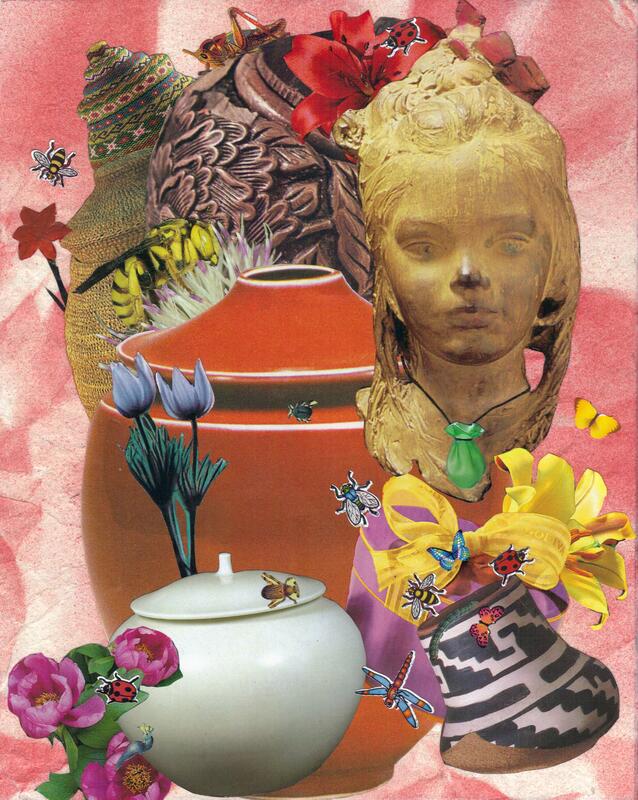 In my collage, Pandora, who wears still keeps her golden key in the medicine bag strung around her neck (perhaps she will encounter other boxes) has already unsealed her jar (bottom right corner) letting loose a swarm of noxious insects, many of which fly and/or sting. The insects have long since dispersed. Now, months later, something new has appeared on Earth – flowers. Many of those flying, stinging, creepy-crawlies were pollinators. Not only is the world awash in beauty, but a new kind of food is growing in abundance – mangos, paw-paws, bananas, apples, pomegranates, peaches pears, watermelon, pecans, walnuts, cashews, almonds, potatoes, tomatoes, zucchini, cauliflower, eggplant, squash, beans , chilies – the list is endless. You can see these flowers in my collage and also the pollinators, without whom much of the world’s population would starve to death. The closed jars represent the potential for discovery – the potential for emptying that leaves the womb, which all jars represent, ready for new life. The emptying is essential to creation; be it a baby, a book or a better mousetrap. The sealed jars are the catalysts of curiosity, harbingers of action. Pandora is the universal girl who dares act, who uses the gifts she’s been given to initiate change.